The 62020X6 is Cartier's Roadster series model with a thrilling combination of 19 ct black and white diamond. This wristwatch is a gorgeous statement of luxury and sophistication. This Cartier is protected by scratch resistant sapphire crystal with case diameter of 40 millimeters . Its handsomely crafted 20-millimeter band, case, bezel, and bracelet are featured in a high quality stainless steel. Furthermore, the 62020X6 model wristwatch's dial has three sub-dials for its chronograph functions and date window at 3 o'clock. There are Roman numerals that revolve around the bezel with dashing black dial. The watch features a precise, Automatic movement. This beautiful piece is water resistance up to 330 feet. 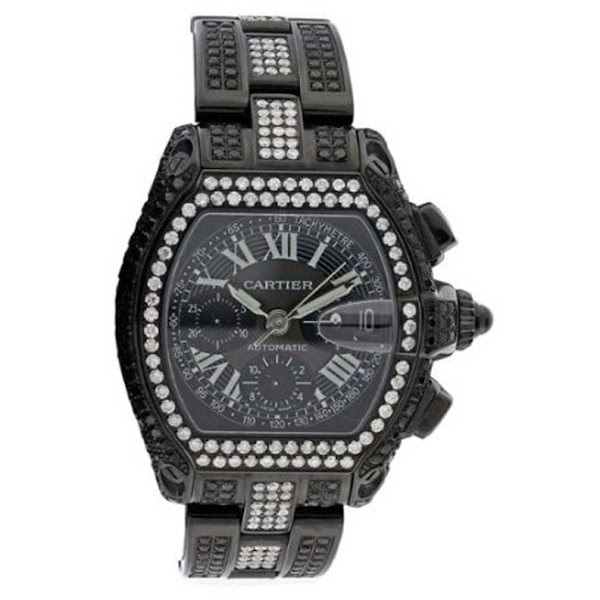 This Cartier Roadster's original price is $17,000. You can find an original Cartier 62020X6 Watch at the site(s) listed above. However, we don’t guarantee its availability as being listed here simply means that those site(s) has the item in question by the time we wrote the review. The review in this page is written by garnish at Saturday, March 17, 2012. The post is tagged as analog, automatic, cartier, diamond, men, watch.